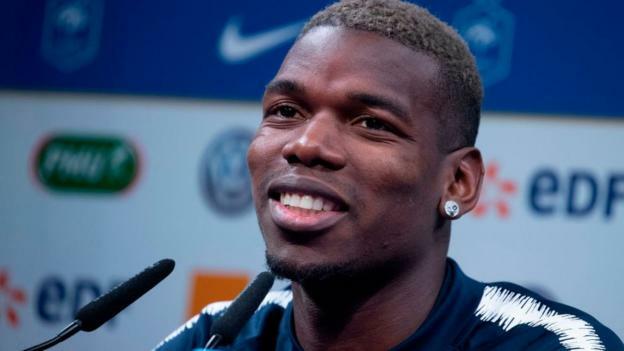 Midfielder Paul Pogba says Real Madrid represent "a dream for every footballer" but insists he is happy at Manchester United. Come on this is the standard response to the question football fans really need to grow up on this sort of stuff he's asked an awkward question by a journalist and he responds with the most generic straight bat answer you can give. Tahith Chong basically said the same thing when he was asked about a loan move to Feyenoord next season. Ronaldo, De Gea etc have all said the exact same things you never want to rule anything out as a player because those quotes can come back to haunt you in life always keep your options open especially when it comes to your job. You have to say that the club in question is a great club as who knows one day you might want/need to go there but you then follow it up with saying you are happy at your current club. This is what they are trained to say. Players don't have loyalty anymore why should they they've seen the other side where their mates are chucked on the scrap heap by clubs, every year coming through the academy half your mates don't make the cut this is ruthless stuff. You're only worth £300k a week while you're playing well suddenly you don't play well and everyone wants you out and off the wage bill just look at how we talk about Sanchez or Rojo or Smalling or Jones or Rooney when he was here. great club is a different thing from dream club. It's nothing to do with loyalty, there is no way Pogba is staying at united, we all know that. But it was an idiotic thing to say none the less. We are on the back of two losses, fighting for top 4, two minutes away from the club and he says another club is a dream club and he's full page again for the wrong reasons. Well the next line about being happy in Manchester along with all the positive stuff he said about Solskjaer to me pretty much confirmed in the short term he wants to stay but that doesn't really grab a headline like a juicy transfer rumour does. I really don't think it's that bad and Madrid are a dream club just like Utd are to players who grew up watching us compete for European Cups. Yeah I'm sure at some point he fancies playing in Spain but I imagine every footballer is thinking this now as it's where the top players go even Rashford & Lingard who came through our academy might fancy it one day and the Spanish players might fancy giving England a go. The only thing that kept the top English players in England during the 90's/00's was the PL money going through the roof. I doubt he was thinking about the results and wider context when this with this question he was probably thinking how many more of these do I have to answer before I can get out of here. I know Utd have lost 2 in a row but I imagine the place is still buzzing given where we were 3 months ago. Not really bothered by his comments, players can’t win when asked about the future or other clubs, if they make respectful comments like Madrid are a dream/great club then they are chastised. If they say nothing they are accused of hiding something or not being forthcoming in their thoughts. Sure all of us aspire to get those dream jobs, if Pogba wants to play for Madrid one day then fine but as long as he is committed while he is here. And like jsp his comments about how he’s happy here and about OGS seem to get side tracked for the ‘big’ headline of him saying how Madrid are a dream club. Looks like a fun summer ahead for us with this one. If Madrid want him it’s 150m my guess istheyd like him but they can’t afford him and that might be a problem. On Paul Pogba: "I don’t like to talk about other teams players of course but this is another challenge with international breaks. Players are available all the time as well and it’s a different environment, a general talk. "Paul is a very nice and polite man who then answered a general question on Zidane who is an icon in France, a fantastic manager, he used to be a fantastic player and he’s just politely answered that question but Paul’s happy here, he’s going to be a big, big part. You like to build your team round him and that hasn’t changed at all." They must have sold another training ground if they've got that sort of money considering they're planning on re-developing the stadium as well over the next few seasons. I think the way he's played over the 3 years at Utd will make the Spanish boys nervous about taking him because he hasn't been consistent and in those clubs you have to be perfect nearly every week. As for Pogba I can see why he might want out he wants to win things and he must be frustrated at the lack of quality players around him at Utd as he can see it's not a quick fix to get this team back on top of the league especially with City being as good as they are right now and there's nothing to suggest that dominance will change in the short term. This is the thing with Pogba there's always a lot of noise around him no matter what he's doing some of that is probably leaked by his agent but a lot of it is probably just made up because a Pogba story gets clicks. Madrid are looking for US investment I think, for the ground. I don't think I would rush to play for Zidane yet, I'd want to see how he gets on without Ronaldo to save the day. Ronaldo part II then! Why can't players just shut up, play football and let things go on behind closed doors. Absolutely no need to say this or tease it. How does losing Pogba for 125m and signing Coutinho for 90m sound? Based on recent performances terrible. Coutinho has really struggled to play the central midfield role for both Barca and Brazil really his best position is the left of the front 3 and we have Martial there so bringing in Coutinho makes no sense to me. What was interesting was Ole's response to the comments basically suggesting the whole thing was twisted this is always the danger with quots nearly always the quotes are taken in isolation no one ever prints what the question was. inflation in football puts him at a lot more. I think there’s a case for selling Pogba he is a massive distraction but I’d rather see us put better players around him and reduce the reliance on him. Given his off field value to Utd as well I think Ole would have to make a big case to Woodward to force the club in to selling him. I'd sell for that price. I wouldn't sign Coutinho though no thanks. This is the question say we sell Pogba, who can we actually get to replace him? anyone who wont constantly put us in the press for the wrong reasons? We need to sign him up or sell him, or it will be another year of disruptive rumours. He would be hard to replace, of course he would. Any player who is worthy of replacing him will obviously cost a fortune also. but @Mr C has said it above that we do one or the other, Pisses me off beyond belief the rumours flying round about De Gea this and Pogba that, your always going to get rumours, but when a player is happy at a club the rumours have no reason to start. No smoke without fire im afraid. What's he doing that's putting us in the press for the wrong reasons? By all accounts he's done one interview where there's been a fair bit of twisting of what was said to create a story. There is no smoke without fire I don't doubt for one minute that he'd jump at the chance to join Madrid but I don't believe he's downing tools to force it like some people (not you) seem to be suggesting. So you'd rather have someone who is rubbish but keeps quiet? He signed a 6 year contract 3 seasons ago Utd are in no rush to sort him out a new deal he's already one of the best paid players in world football and there's nothing in his 3 seasons to suggest he deserves a pay rise. I actually think Utd would be smart to renew him if they could but until Sanchez is going they're going to struggle with any contract renewals because that deal has destroyed the wage structure of the club. On the pitch Pogba is by far our most consistent and influential midfielder if we lost him we have zero creativity in midfield if Madrid want him given all the issues that come with him that tells you how good he is. The only logic I see for selling Pogba is if we can get a player who is better and will make the team better, if we sell Pogba that money will get p*ssed up the wall. Or we sell Pogba for something silly like 150m could we use that to get 3 x 50m players that actually make us a stronger team? I think we could but I don't think we've got the people in the club who are smart enough to spot these players the way football is now I think it's almost impossible for Utd to do unless we can exploit buy out clauses in contracts Utd will end up paying silly prices so doing what Spurs did with Bale for example won't happen anymore. It's not just Pogba, it's his agent too. He promised Pogba a move to Madrid after 3 years apparantly. So I assume a lot of it is coming via him. And Marid will probably target Hazard this year. So we might get another year out of him, but is a whole year of his agent sending mesages to the press. But do we want that, we want to building towards something, not have constant threats of players leaving or wanting to leave. Rashford, we need to give him a payrise to a reasonable price with the promise of a new deal in 2 years if he carries on as he is. That boy we have got to tie down, the most important deal to be done. I think when you buy" Suqperstars " the agent is part of the package. I don't like it but that's the reality. In terms of him going I am indifferent either way. Of course if we sold him and didn't bring anybody in we would definitely have zero creativity. However we would have a load of money from his sale and although i dont know the market like i did years ago there will definitely be players out there. It might take signing 2 to replace him. I don’t actually think Madrid want Pogba. How many noises have they made about getting him? When Madrid/Barça want a player they never shut up about them. All the noises seem to be coming from Pogba’s camp. I wouldn’t even answer the phone if the deal is less than £150m the market has moved on since we signed him. I also think that whilst he’s hot and cold when in form he’s one of the best in the world and if he goes to Spain the extra time and space will mean he’ll tear it apart weekly. Pretty sure Marca run a massive story about him on the front pages the other day revealing details on "operation Pogba" I know creative codename. I know what you mean but it would seem there's a lot of transfer talk around Madrid currently as they plan a squad overhaul this summer the targets change daily Pogba, Hazard, Mane, Icardi etc. I have to say the quotes from the Pogba camp seem more geared towards him being happy this whole story is blown up from him saying Zidane is a legend in France and that Madrid is the sort of club you dream of playing for when your growing up. This was mixed in with many other quotes about being happy at Utd, enjoying life under Solskjaer, wanting to bring the good times back to Utd it's just standard interview responses footballers know never to close doors to anything. It's not just the more time and space it's the better players around him at Utd he's the focus of every teams defensive plan at a team like Madrid/Barca the opposition have a lot more people to try and stop.